We didn't have a chance to read and review this one but still wanted to support Meg Collett. 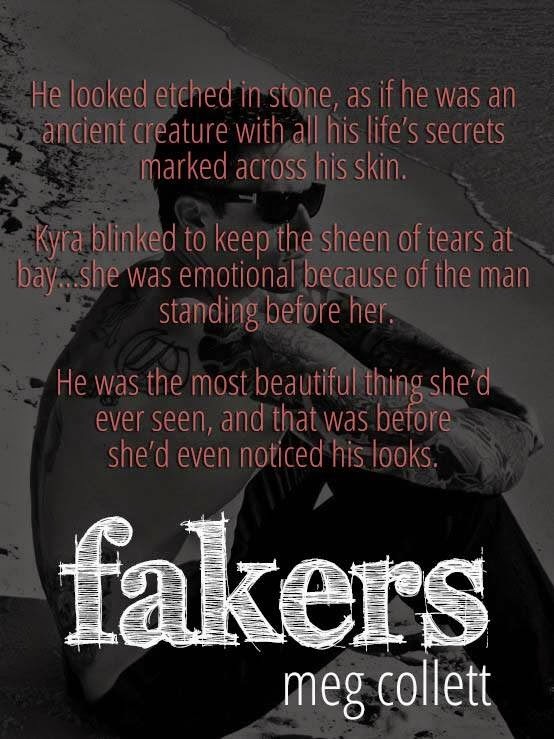 Check out an excerpt and teasers from her newest release, Fakers. Kyra Aberdeen is a Youtube sensation. Her bubbling personality and fresh beauty capture the hearts of millions each week through her videos. But she’s just faking it. Because beneath the surface is a simmering darkness that threatens to pull Kyra under some days. She masks her depression with a sunny smile and bright laugh. When Kyra moves to Canaan Island and buys her deceased mother’s childhood home, she is hoping to confront the lurking darkness that haunts her every step. But life never goes according to plan, and when Kyra meets her grumpy contractor, Hale Cooper, it seems he’s not going to make things any easier for her. Yet Kyra is drawn to him, to a man whose every emotion plays across his face as he feels it. But she’s never let herself get too close to anyone before, and she finds herself in uncharted waters. If she lowers her guard and allows herself to love Hale, will the darkness creep in too? “He stopped it?” Stevie asked, slightly breathless. “Like he needed to taste every part of my mouth. Like maybe he had wanted to kiss me too, but I was the one that did it first. It kind of felt like he wanted every inch of me, but all he had was my mouth. So he took it. And all I could do was just hold on.” Kyra shrugged when she was finished. Meg Collett lives deep in the hills of Tennessee where the cell phone service is a blessing and the Internet is a myth of epic proportions. She is the mother of one giant horse named Elle and two dogs named Wylla and Mandy. Her husband is a saint for putting up with her ragtag life. End of Days is her first series.